Yes, you read that right — three dishes, a bottle of beer, or ½ a litre of house wine, water, bread and coffee for as little as £4.60 or $7.13! Some establishments also offer a starter and a third course, or two desserts and a chupito (a shot). 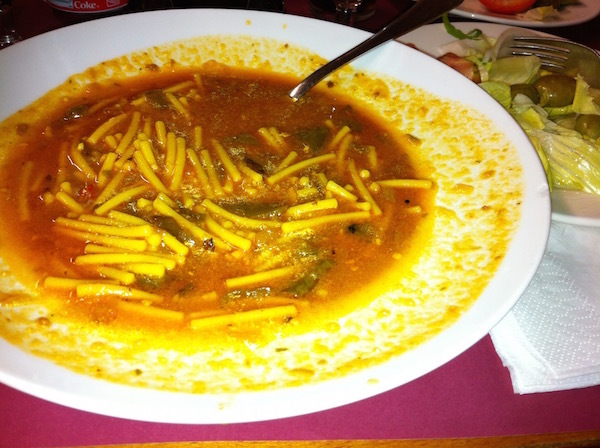 Minetrone soup as served as a first-course as part of a menú del día as served at Morryssom’s. 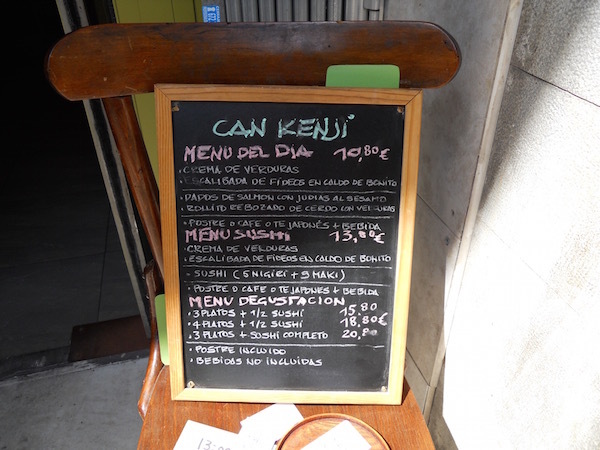 Some restaurants will offer an evening menu of the day — a Menú del Noche —although, as at weekends, these will often be priced at between, say, 3€ and 8€ more person, and likely not include wine. Codillo (or knuckle) served as a second-course as part of a menú del día at Morryssom`s. 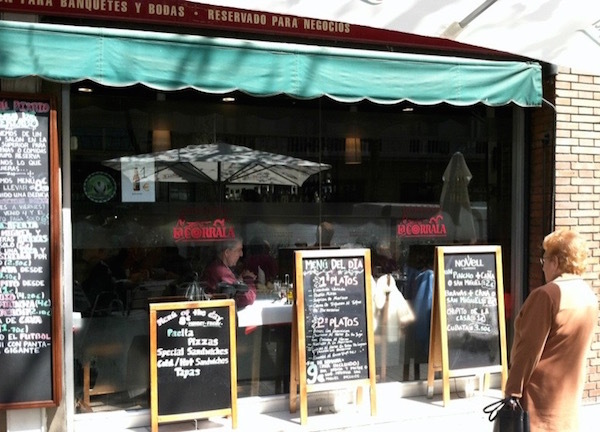 Some restaurants (maybe between a fifth and a third of restaurants open) will offer a menú del día at weekends — though it will usually cost between 2€ and 7€ more per diner and may not include wine. 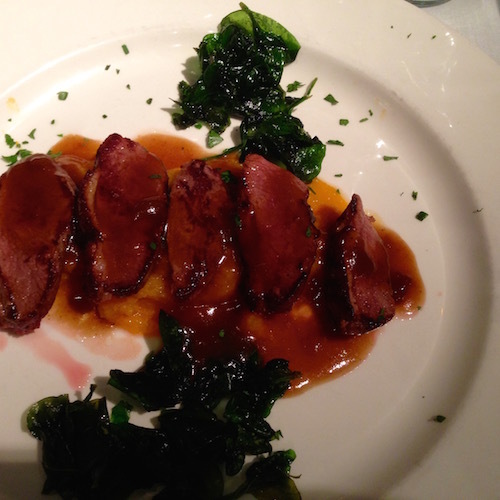 Pan seared duck served as a second-course as part of the weekend menú del dìa served at La Polpa. You’ll also see other lunchtime deals such as a Menú Express or Menú Executivo, which consist of two dishes instead of three, or three dishes in place of four. As their names imply, these deals are aimed at business types and diners on the go. 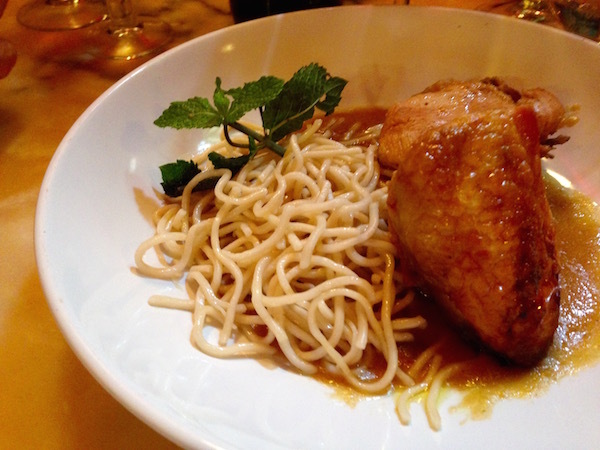 Chicken and noodles as served as a second-course as part of a menú del día at La Singular. 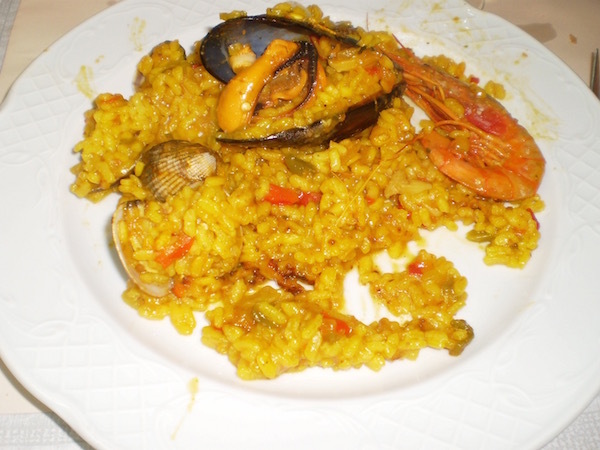 Many people mistakenly believe that the popular menú del día came into being as a way for the dictator, Franco to ensure hardpressed workers had access to at least one good meal a day. Why would Franco have concern for the dietary, health and nutritional needs of workers? After all, since seizing power at the end of the Civil War in 1939 he’d murdered about 200,000 of them, setting aside the many thousands who died of hunger during Los Años del Hambre in the 1940s and 50s. In fact, the concept of the menú del día was introduced to Spain on March 17th, 1965, when Franco’s Minister of Information and Tourism, Manuel Fraga, (who was to become known as a hardline Interior minister following Franco’s death) came up with legislation which incorporated the Menú Turístico. Yes, what became known as the menú del día was brought into being by law to help drive development of the tourism and hospitality sector. The law was part of a push to professionalise the hotel, catering and ancillary trades. Fraga hoped to position visitor destinations to take maximum advantage of tourist spending through legally enforceable quality control and thus deliver consistency of experience for vistors and tourists. 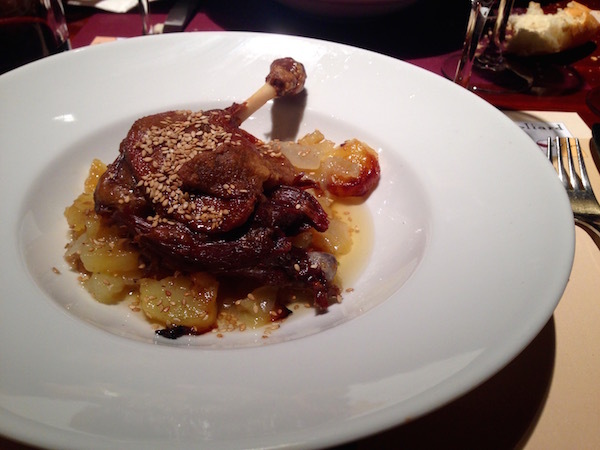 Leg of roast duck with oven cooked potatoes as served as a second plate as part of the menú del día served at Goliard. 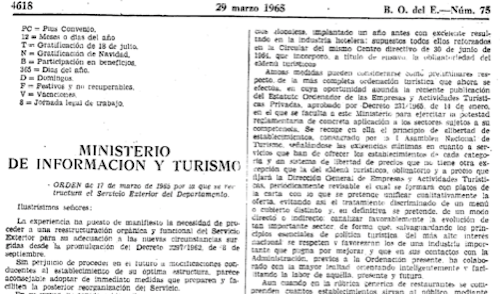 I managed to track down a copy of the Official Bulletin of the (Spanish) State of March 29th, 1965, which features a summary of the legislation. It is fascinating reading. Accompanying legislation also laid down the law regarding the management of cafeterias, university and factory canteens, as well as restaurant and café cars on trains. In brief, the legislation set out a restaurant status system and the minium requirements demanded of establishments according to their given status. Restaurants were graded as being: Luxury, First-Class, Second-Class, Third-Class and Fourth-Class. Every restaurant was obliged to display a sign indicating their status: 5 Forks = Luxury, 4 Forks = First-Class, and so on. If you are a serious foodie historian, or a social historian with an interest in food…and you can read Spanish, well, you’ll have to read it. (If interested, subscribe to this website and drop me a line via the Contact Me page, and I’ll gladly send you a pdf of the legislation). The legislation goes into extraordinary detail. Remember, this isn’t a nationally agreed voluntary code of good practice — this is the law; this is a political head of a government department ordering restaurants what range of dishes they are required to serve, and in what kind of ambience. The law legislated for the quality of ambience as provided by interior decoration, amenities, furniture and tableware. …In all cases the first head of the dining-room must know English and French. The law also required that the layout and design of all restaurants should be formed of a response to the idea of creating an ambience which corresponded to a particular region of Spain, or, in the case of restaurants serving a foreign cuisine, to the particular country. This dictat also applied to the personnel. Presumably wait staff employed by Italian and German restaurants, (which were popular among a certain strata in the 1940s and 50s) had to look, and dress, like Italians and Germans. So much for the dining-room, what about the food and wines to be served? Article 26: In Luxury establishments — A first group of 10 starters and 4 soups or cremas (cold soups or purées). A second group of 6 specialities based on vegetables, eggs or pasta. A third group of 6 specialities of fish. A fourth group of 6 specialities of meat. A fifth group of 3 types of sweet or ice-cream, cheesses and a variety of fruits. Article 27.1: Establishments in the Luxury and First-Class categories will offer a wine-list which will include internationally recognised prestigious brands. Article 27.2: All establishments, of whichever category, will be obliged to include wines common to the country, white and red, which are pure, clean, with an honest palate, with an alcohol content of no less than 12º. The client can choose a dish from the first group: another dish from the second, third and fourth group, and lastly, a dish from the fifth group. Article 29.2: The Menú Turístico will include in the price the serving of approximately 80 grammes of bread and a ¼ litre of wine common to the country and having the characteristics as indicated in Article 27 of this ordinance. The law also stipulated, again in incredible detail, the minimum range and quality of kitchen equipment, and ordered that Head Chefs working in Luxury, First-Class and Second-Class restaurants had a knowledge of English and French. The Menú Turístico was principally aimed at hotels and restaurants trading in the rapidly developing tourist destinations on the Mediterranean coast. However, the concept of an economical fixed-price menú became incredibly popular with natives, and soon spread right across the country. By the early to mid 1970s the Menú del Día was pretty much available in every single town in Spain and Catalunya. Today, most ethnic restaurants of every hue: Chinese, Japanese, Indian, Nepalese etc also offer menús. I’ve titled this article: The Secret Life of the Menú del Día — obviously it will not be a secret to the thousands of Spanish and Catalan workers in the hospitality industry who attended catering school in the 1960s and 70s; for they were required by another law to learn this law. Likewise, you too now have no excuse. Forthwith, if anyone ever tries to sell you the idea that the Menú del Día was engineered and promoted by the cruel dictator, Franco, in order to help put food into humble workers’ bellies — well, you can now confidently tell them where to shove it. Such dangerous notions only add lustre to the deliberate myth-making of Francoist apologists, who will tell you that he was a benevolent, father-of-the-nation type figure. Have no doubts — Franco was a cold, heartless butcher. The law was amended in 1971, ’78 and again in 1980 — but was not finally removed from the statute book until January 10th, 2010. Bar Restaurante Palermo — Here’s my write-up. And here’s my Spotted by Locals write-up. Cal Boter — Here’s my Spotted by Locals write-up. Can Kenji — Here’s my Spotted by Locals write-up. Goliard — Here’s my write-up: 10 Good Reasons to Go with Goliard and Spotted by Locals write-up. La Rita — Here’s my Spotted by locals write-up. La Singular — Here’s my write-up: Several Sound Reasons to Seek out La Singular and Spotted by Locals write-up. Morryssom — Here’s my Spotted by Locals write-up. Enjoy discovering the pleasures of a good menú del día in Barcelona. it says no comments. good article. well researched, man. Good article, but misinformed. The origins of the “menu turistico” are not the same to the precedents “Plato Unico” and “menu de la Casa”, actually aimed to the workers. The article is right about the “menú turistico” but this origin does not explain why there were set menus prior to 1965, and why you find menus del dia in remote, un-touristy villages and areas of the cities where few tourists go. “Many people mistakenly believe that the popular menú del día came into being as a way for the dictator, Franco to ensure hardpressed workers had access to at least one good meal a day. Why should Franco care about workers? Not because he was a nice guy, but there where good reasons: the country needed to be rebuild, propaganda (that was a popular measure)… Murdering oppositors to the regime has little to do with willing to have a healthier (and less conflictive) workforce. Their own survival and welfare depended on rebuilding the country. It was a wise move. He could be evil, but not stupid. Thanks for taking time and effort to leave a comment. Miguel Ángel Del Arco Blanco, University of Granada — Hunger and the Consolidation of the Francoist Regime 1939-1951. Eleven years after the end of the civil war and 90,000 madrileños are living in caves with no running water— doesn’t seem to me that Franco was in any hurry to feed workers! In fact, he mostly washed his hands of the problem and handed the problem to Auxilio Social (latterly Sección Femenina) — a group of zealous though patently misguided Falangist women, and the Church. In response to your comment, I am more than aware of the history of the Plato Único — a completely different concept, and not the topic of my post. The Plato Único was only available for 15 days of every month, and, more often than not, only available to supporters, or professed supporters, of the Movimiento. The Plato Único was most certainly NOT aimed at workers per se, but only at those workers who were considered necessary for the survival of Franco’s regime. Don’t know if you know the film, ’13 Roses’, but there is a telling scene in which Franquist bombers drop sticks of bread — not bombs — on a starving population — though not out of concern — every stick of bread is wrapped with an image of the ‘benevolent’ leader and the slogan, ‘For Bread & Victory’. You say, “The country needed to be rebuild [t]…”. Sure enough, obviously. But who ruined it to begin with? Not the ‘Reds’.Franco had control of most Spanish artillery units plus access to German and Italian artillery and bombers — and he had no hesitation whatsoever when it came to using those military resources against civilian targets.In fact, Franco was responsible for giving the order to launch the FIRST EVER AIR RAID on a European capital. You say, “Murdering oppositors to the regime has little to do with willing to have a healthier (and less conflictive) workforce.” Again, the fact is, Franco didn’t only murder the opposition, he also killed many on his own ’side’ too. There are dozens of reports of loyal, Falangist mayors and ordinary people, for example, who were shot or garrotted for not killing as many ‘Reds’ as he thought they should have when they had the chance.And dozens more who faced death by firing-squad for simply being in the wrong place at the wrong time. Franco employed a vast army of technocrats who worked out, in exquisite detail, what the necessary calorific intake was necessary for every person.These calorific intake charts not only allowed for age and gender differences, and differences of occupation (i.e. manual worker/office worker etc) but were also based on which region of Spain. So, for example, whereas it was deemed that a worker living in Almería needed 2672.8 kcals a day to survive, a worker in the rural parts of the region of Jaen only required 1,519.6 kcals a day to continue functioning. And so on for the whole of the country. In 1943 a person in Almería was thought to require 47.6 grammes of flour a day — this, it was stated, would provide 168.1 kcals a day; 11.9 grammes of beans every day — 39.3 kcals a day. And so on, and so on, and so on. Further, another army of technocrats worked on how many labour hours (or part hours) were required to complete various tasks involved in agriculture and food production, and in industry, making the machinery that was hoped would boost production. When these stats were correlated with population statistics there was always a deficit. In fact, even given their own miserly food intake projections, the Franco regime (until 1959) only ever managed to provide, or organise the distribution of, between one-third and a one-half of the foodstuffs thought to be necessary. When these population, food intake, and agricultural and industrial output figures were correlated they would produce the optimum number of people per district who could and would be employed.Surplus labour was either commanded to emigrate to another region (viz. rice workers from Murcia and Andalusia being moved to the Delta d’Ebre) or survive outside the highly regulated rationing system (las cartillas de racionamiento) which, no surprise, put people into four categories based on gender and age and three sub-categories based on social class: ‘upper’, ‘middle’ and ‘lower’ class. Can you guess who were issued with more, and more generous ration cards? It wasn’t the industrial workers, it wasn’t day workers (jornaleros). The functionaries charged with distributing ration cards were more often than not staunchly loyal, and cruelly vindictive, supporters of Franco. So, as far as Franco and his technocrats were concerned, workers (above an optimum number in a given area) were expendable, and could be, and were, ‘expended’. You say. “He could be evil, but not stupid.” Could be evil? He WAS evil. Stupid? Well, I’ve never said he was stupid. He was very good at divining human nature, and very good at dividing people. (The fact of this discussion is proof of that). But, by dint of his not being stupid makes him even more evil — he knew exactly what he was doing — and what he was doing was deliberately starving huge sections of Spain’s working-class. And, it must be said, Franco’s warped religious beliefs also demanded of him that Spain undergo an extended period of perdition and atonement. He was never in a hurry to feed ‘his’ people. If you need to see some of Franco’s food production targets, and calorific-intake tables I could arrange to send them to you. and, a book I’m currently reading, and enjoying, Feeding Barcelona 1714 — 1975 by Montserrat Miller. Thanks again for taking the time and trouble to post a comment. However, nothing you have written succesfully contradicts, nor causes me to correct, my central point about the history of the menú del día. 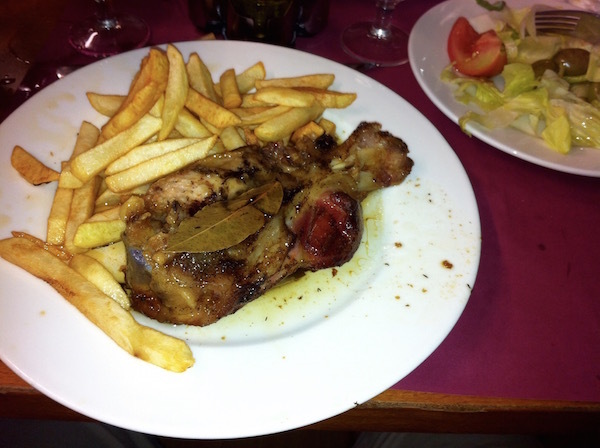 BTW: I had an excellent menú del día today (Sunday) in Poble Sec, after visiting MNAC. Two cañas, a mixed salad, gazpacho, salmon and chips, liver and chips, a coffee, a flan, a 1.5 litre bottle of water, a bottle of vino tinto, and bread, all for 18€ for the two of us. I, unfortunately, have no sources to link. I only can tell what I lived (I’m old enough to have lived under Franco rule!) and what my parents and grandparents lived (during much worse times) and told me. I only wanted to give the reasons I did learn from them for a “menu del dia” aimed to workers, who actually did exist before the “menu turistico”. Maybe they were wrong and there were other reasons I ignore. But the fact is that “menu” aimed to workers existed, for whatever reason, but it did exist. I have no time or interest on researching or looking for literature about something from a period I experienced myself (that will sure bring many memories that I prefer not to remember), so I will leave here. Thanks anyway for the links. I just though you would like to investigate more as, sorry to say, your otherwise very interesting blog entry is not 100% accurate. No “paper” will convince me of what me and my family experienced first hand.